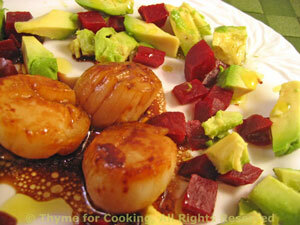 Seared Scallops with Beet and Avocado Salad, Thyme for Cooking gourmet starter. I love the colors of the beet and avocado together. Food should be pretty. Plus the earthiness of the beets works well with the smooth avocado. Use Truffle Oil if you have it; if not, a good olive oil. Heat oil and soy sauce in a small skillet over medium-high heat. Add scallops and cook quickly until just opaque, turning once. Remove. Cut avocado and remove pit. Remove flesh and cut into small cubes. Cut beet into small cubes the same size. Divide the scallops and place in the center of 2 plates. Arrange the avocado and beet cubes around the scallops. Drizzle Balsamic vinegar and truffle or olive oil over all and serve.